The Louis Vuitton Agenda PM refills aren’t exactly budget-friendly. Although they fit in the LV small ring agenda cover very well, not everyone is willing to spend much on these planners. That’s why I scouted for an alternative refill that's more affordable, but still functions like the LV ones. Here in Singapore, I found a stationery and gift store called kikki.K. The stylish gifts and paper products of Scandinavian designs got my attention as I was walking around VivoCity. Some of their newly-released products are still pricey, but they often have discounts. My eyes laid upon their time planner refill. These refills have weekly and monthly views, perfect for the requirements I’m looking for in my day-to-day agenda. As I’ve mentioned in my previous post, I bought only the LV diary refills which didn’t have the monthly pages, so this one from kikki.K is just perfect for the agenda set-up that I need. The kikki.K Time Planner Diary Refill with the monthly and weekly views are available in small, medium, and large sizes. I picked the small one, as the dimensions closely resemble the LV PM agenda refills. Kikki.K’s time planner refill is pretty straightforward. From the cover page, they included a simple welcome note and pages for normal 2019 and 2020 calendar layout. The only extras they included are public holidays for selected countries, which I feel is unnecessary, but could be helpful for someone who travels a lot and would like to plan ahead. These pages are way better than the excessive world map and list of religious holidays from LV. For people who prefer writing conveniently on their planners, kikki.K’s refills are much easier to use than the LV ones because of the ample space in between lines. The week-on-two-pages layout of the kikki.K Time Planner doesn’t have time inscriptions, but indicates public holidays relevant to specific countries. In terms of the paper type, the alternative agenda pm refill from kikki.K has a stark white color and the paper substance is noticeably thicker or heavier than LV’s. Another thing I noticed is that the holes made on the side of the paper weren’t neatly punched. Aside from the layout, what I immediately noticed is the striking difference in paper quality. Louis Vuitton’s agenda refill does feel luxurious, with seamless cut holes and curved edges. Week on two pages agenda refill layout: Louis Vuitton on the left and kikki.K on the right. Next, the LV refills are a few millimeters longer than the kikki.K’s. On the other hand, the kikki.K time planner is slightly wider by about 2mm. Here's the weekly view of the LV Agenda PM refill. The kikki.K page underneath is about 3-4mm shorter and 2mm wider. Finally, both refills have 6 punched holes which go through the rings of the agenda cover. However, the space in between the holes and the edge of the paper for the kikki.K planner is much wider than that of the Louis Vuitton. Take my last year's agenda as an example on how I set-up my small LV planner. When using my LV agenda refill, I only put the basic information page, the monthly view pages (in the complete version), the notes section called Temps Pour Soi, the sticky notes placed at the back, and a maximum of only 4 months worth of week-on-two-pages diary. Notice the slight dents in the middle part of the refills, as the pen holder bumps into the paper when used in the long run. In my small Damier Ebene agenda cover, I added a mini, stainless steel ballpoint pen from Pilot, which conveniently fits the pen holder (a regular pen won’t fit). With continuous use of the agenda (snapping the button closure shut and lifting the tab again and again), the pen holder would hit the center portion of the LV agenda refill, creating slight dents and waves against the silver page glider. Louis Vuitton Damier Ebene Agenda PM cover with kikki.K planner refills inside. On the other hand when using the kikki.K ones, the pen holder will not damage the sides, even if I put in 6 months worth of weekly diary pages and even if these refills are a bit wider than the LV’s. However, that caused a bit of a problem, too. When there are too many papers stacked together, it's a challenge to turn the pages with ease. Hence, the paper gets caught in the rings and creates that crease in the area where the holes are placed. If the kikki.K weekly pages are packed, it’s impossible to turn the pages without the edge getting caught in the agenda rings. That’s because there’s an extra space between the holes and the edge of the paper, which inhibits turning the pages smoothly. I tried cutting the number of pages from 6 to 3 months and it seemed to minimize that drawback. In my current agenda set-up, I use all the functional pages in the LV refill (weekly diary and notes pages) and included just the monthly pages from kikki.K. 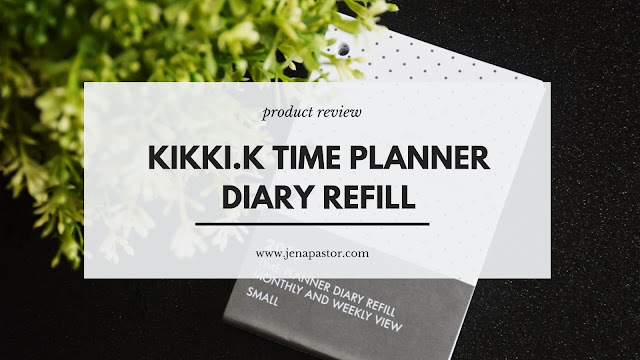 Certainly, there are pros and cons in using the kikki.K Time Planner Diary Refills over the Louis Vuitton Agenda PM Refills. Here’s a quick rundown. Reasonably priced at $12.90, giving you $58 savings as compared to LV’s $71 price. As of writing, the small time diary refill from kikki.K is on sale at $9.03. It's pretty basic and lacks superfluous pages, which is just what you need – a neat and workable planner. The writing space on the week-on-two-pages is so convenient when jotting down entries. The brand is not available in all countries, which makes it difficult to find this agenda refill. I believe selected National Bookstore branches in the Philippines carry kikki.K, but the products and stock that they have might be different. Since it’s not specifically made for the Louis Vuitton PM Agenda cover, the dimensions of the paper lead to pages getting caught in the rings, making it troublesome to turn the pages with ease. Very small space is left for weekend entries and there aren’t any sections for additional notes. Would I recommend this as an alternative for the pricey Louis Vuitton PM Agenda Refills? I would say yes. It’s affordable and it functions the way I’d want my daily planner to perform. Plus, this product is more accessible to me here in Singapore than the popular Filofax ones or the ever elusive Daiso refills. Will I buy this again next year? I believe so, because the monthly pages are functional for me. Disclaimer: This is not a sponsored post. The contents of this entry are purely my opinion and 100% honest based on my buying experience.